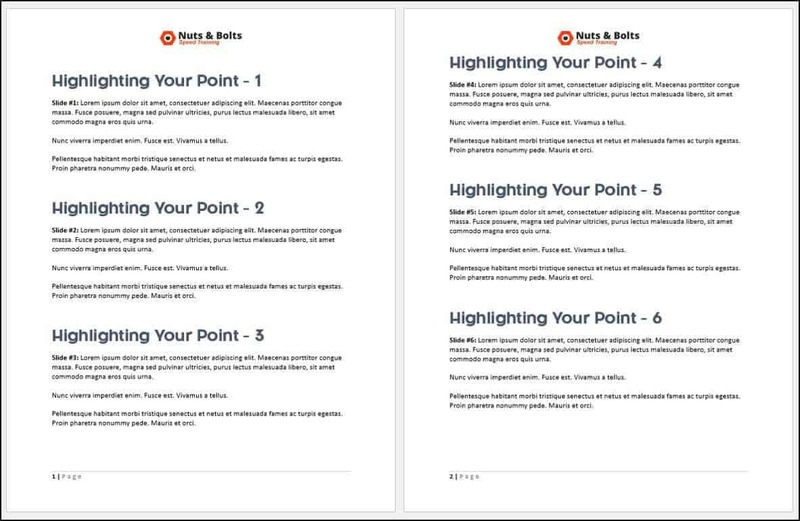 In this PowerPoint tutorial, you’ll learn how to print your PowerPoint slides with your speaker notes as handouts (the way you want them) so that you can get out of the office and make it to Happy Hour. 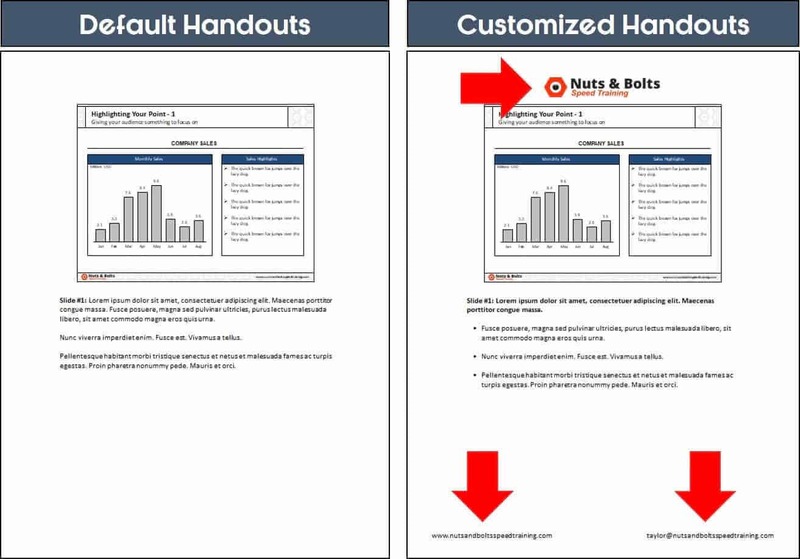 If you are distributing your slides (with or without speaker notes) to other people, I HIGHLY recommend customizing your slide handouts first with your company information on the Handout Master before printing them. That way it’s easy for prospective clients to get in contact with you. For help with this, see customizing your handouts in the Note Master below. 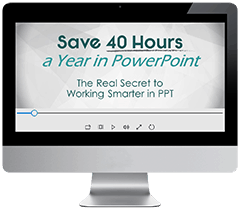 To learn how to turn your PowerPoint notes into the PDF file format, see Convert PowerPoint to PDF. Just keep in mind that, like many things in PowerPoint, there are a variety of ways to print your notes (all covered below) to get to your desired result. Don’t get frustrated with PowerPoint…just get creative. The standard (and most basic) way to print your notes (or speaker notes) in PowerPoint is to have thumbnail image of your slide with the notes directly beneath the thumbnail image of your slide. To see how to not only print your slides with notes like this but also how to customize your slide handouts with your company's contact information, see the short video below. Note: If you are distributing your notes as handouts before or after your presentation, I recommend customizing your notes. This not only makes your handouts look more professional, it makes it easy for prospective clients to get in contact with you. 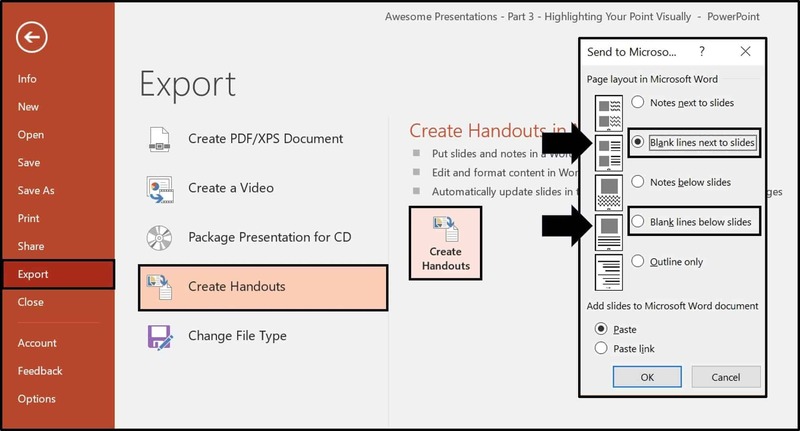 For help customizing your notes in PowerPoint, read on or watch the video above. Note: In the picture above, I used the Header and Footer dialog box to add my email address and website address. For a demonstration of what I did, see the video tutorial above. 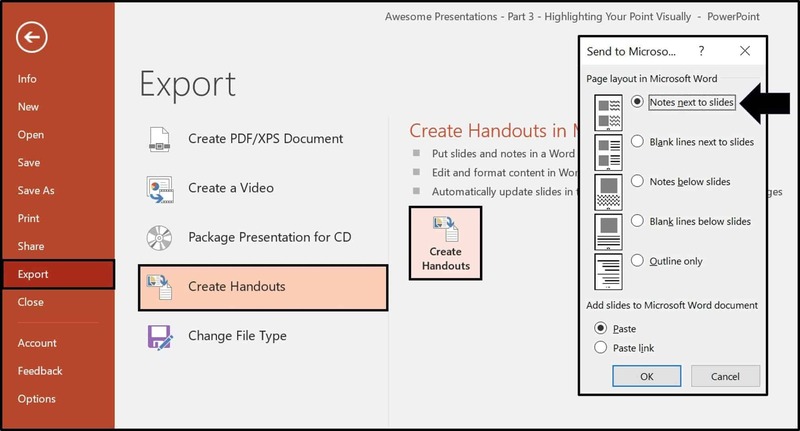 To print your PowerPoint notes as handouts with multiple slides per page, you need to first push your slides to Microsoft Word using the Create Handouts command. 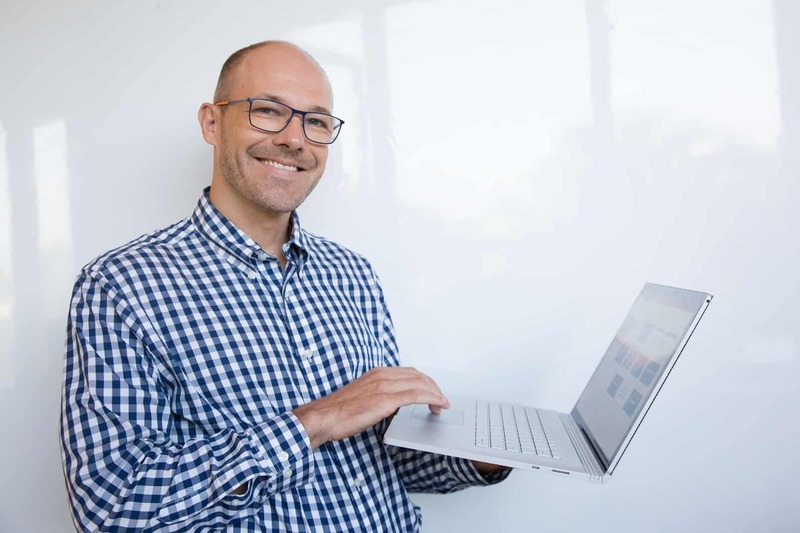 Selecting 'Notes next to slide,' PowerPoint pushes your slides into Microsoft Word in a table format that you can then format in Word as you normally would. 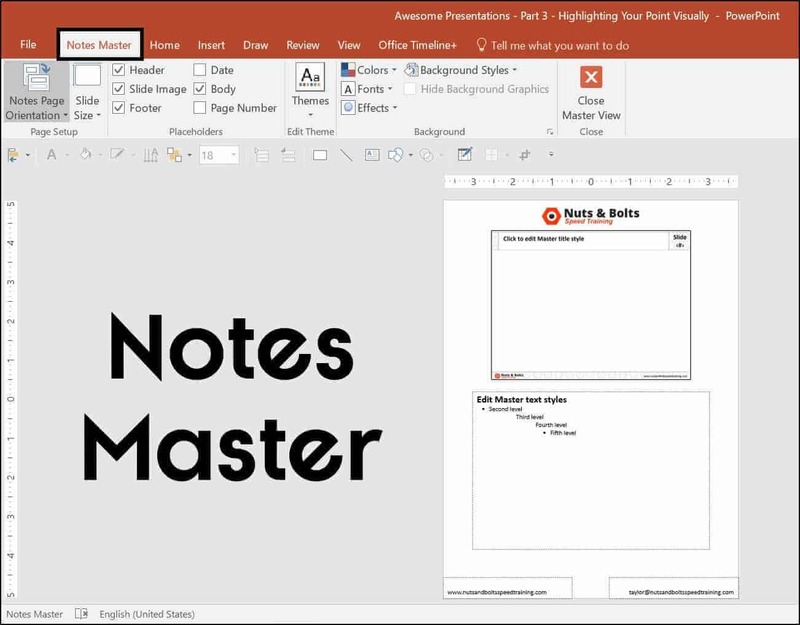 For some Microsoft Office tricks you can pull off in this format (including getting your real slide title names into the table using the Outline view), see the video tutorial on how to print your PowerPoint notes only below. Yes, you can print JUST your PowerPoint notes (no slide thumbnail images) without messing up your presentation by deleting things on your Notes Master (not recommended). To see how to pull this off using a combination of the Create Handouts command and the Outline View in PowerPoint, see the short PowerPoint video tutorial below (it will make the most sense that way). To see how to get to the result pictured below, see the video above. 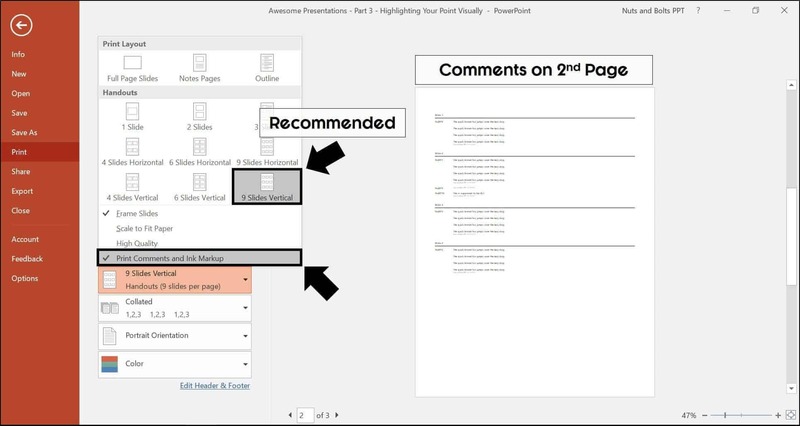 Assuming you have comments in your presentation, you can pint those in any of the PowerPoint Handout or Outline views. It’s just important to note that PowerPoint comments always print on the second page. Your first page will be the handouts themselves (with the comment marked on the slide). The second will be the actual comments. As this tends to waste a lot of printer paper and ink, I recommend using the 9-slide layout a unless you have a specific reason to do otherwise. 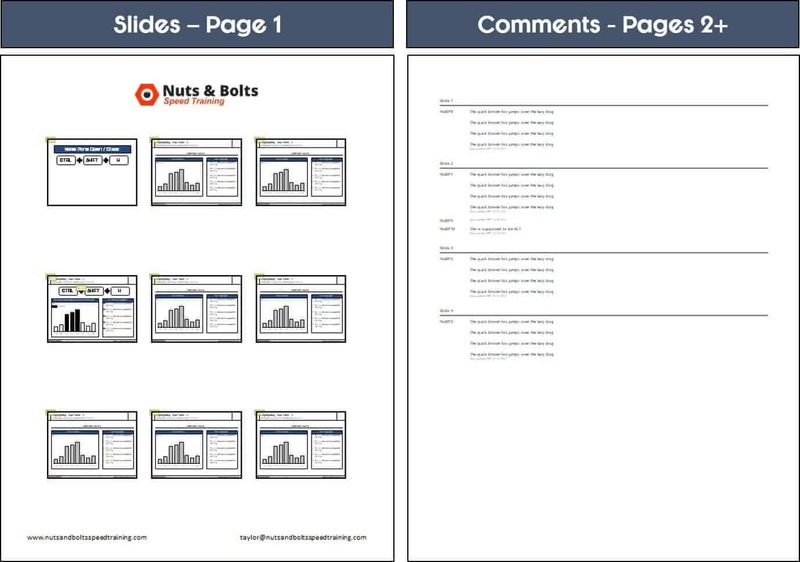 The reason I recommend choosing the 9-slide layout, is that all of your comments will stack up nicely on the second page behind your slides, tagging each note to the slide on the preceding page. This saves you reams of paper and ink at your office. 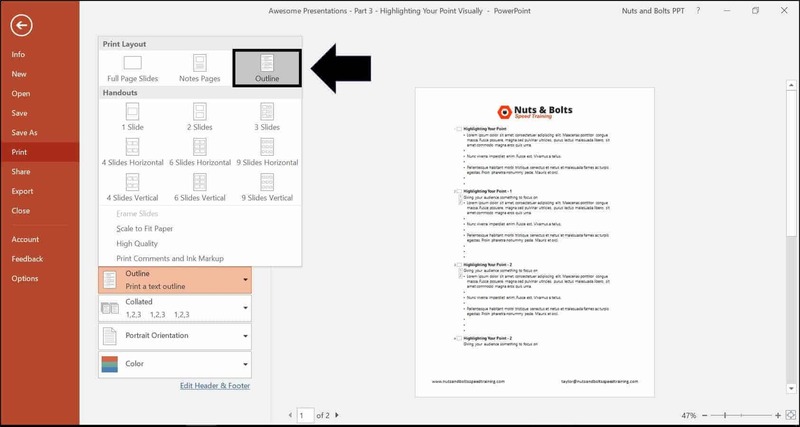 The easy way: This involves directly printing your slides from PowerPoint with the default lines that PowerPoint gives you for taking notes. 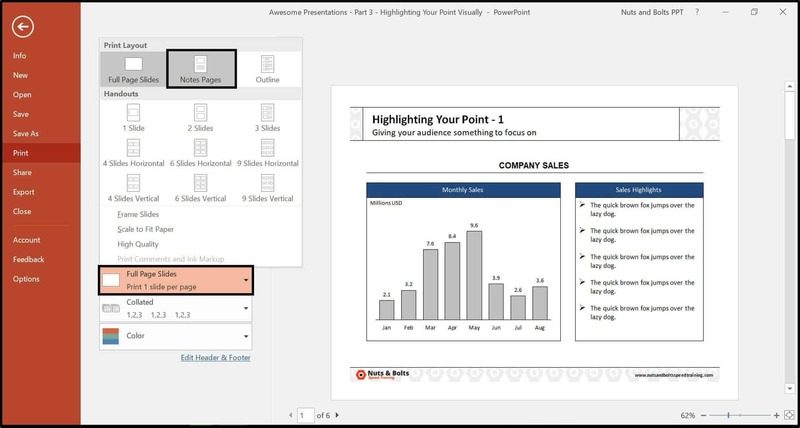 The customizable way: This involves converting your PowerPoint slides to Word, where you can then adjust and customize the lines for your notes. 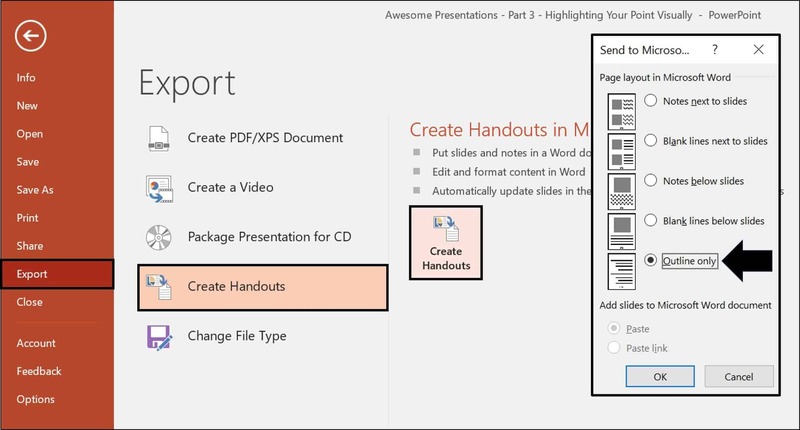 Note: You can customize this layout using the PowerPoint Handout Master. 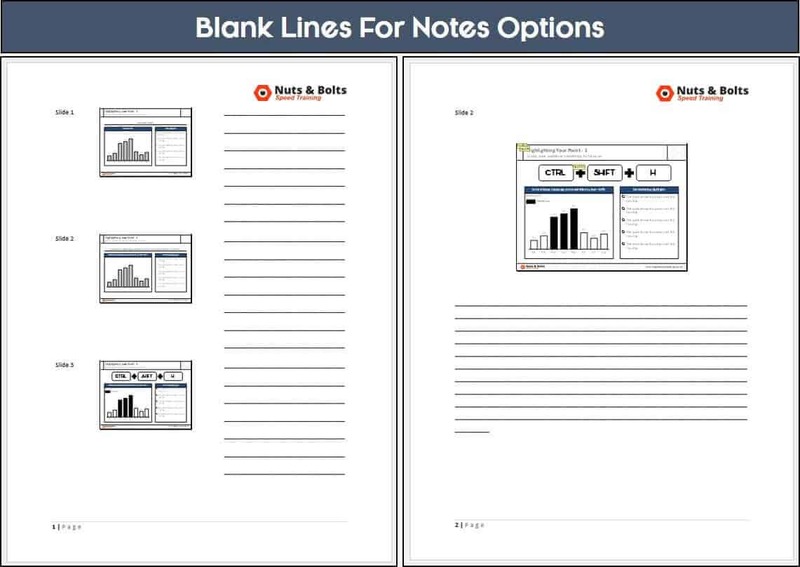 For help customizing this view, see the video on how to print notes above. 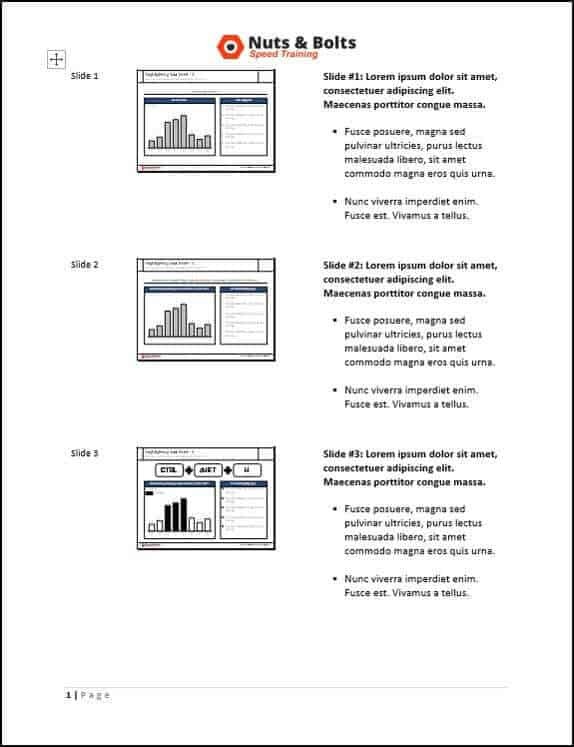 Clicking OK, your PowerPoint slides are pushed to Microsoft Word in one of the table formats pictured below. Once your notes are in Microsoft Word like this, you can then customize them anyway you like (fitting more on your slide etc.). Before you get TOO excited about printing your PowerPoint outline, it’s important note that only information that is within your content placeholders will print. Note: If you don’t see all the content in your Outline (you only see the slide titles, for example) that means that your Outline View is collapsed. Within the Outline View (click into that actual Outline View on the left), hit the expand keyboard shortcut: ALT + SHIFT + 9. To learn more shortcuts for working in the Outline View in PowerPoint, see the shortcut tutorial below, which will help you fill in your PowerPoint template quickly. 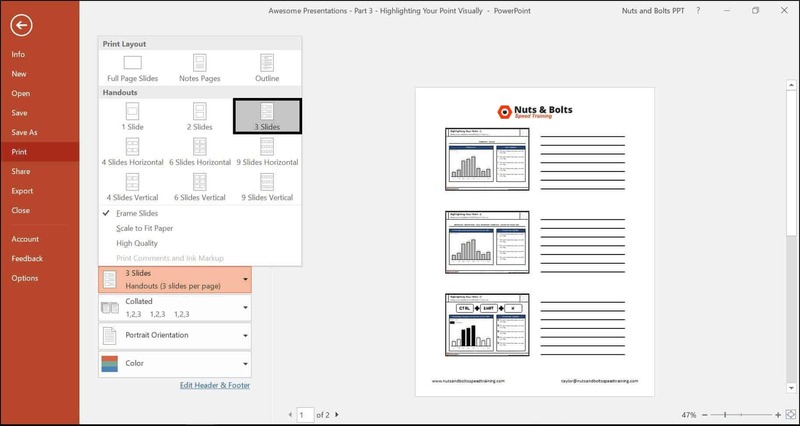 For help building your own custom PowerPoint template that actaully works, see How to make a PowerPoint template. Pushing your outline into Microsoft Word like this allows you to customize and edit the outline before you print it.